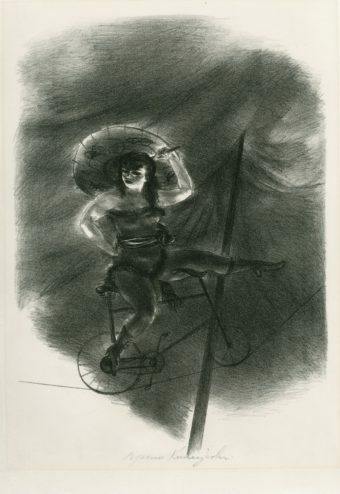 Yasuo Kuniyoshi, Cyclist,1939. 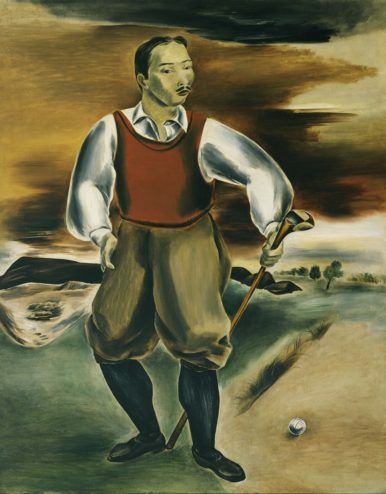 Syracuse University Art Collection © Estate of Yasuo Kuniyoshi/Licensed by VAGA, New York, NY. 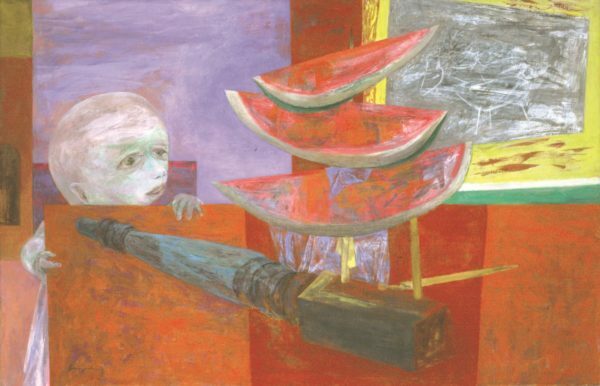 Forbidden Fruit: Yasuo Kuniyoshi’s America explores the life and career of the noted 20th century Japanese American artist through the lens of Forbidden Fruit, 1950. This eerie and confounding late painting from Syracuse University’s permanent collection ultimately reveals Kuniyoshi’s tortured state of mind close to his untimely passing in 1953. The artist had spent over 40 years in America, studying art in New York and establishing a group of collectors who appreciated his blending of modernism, folk art, and Japanese sensibility into a singular style. Discriminated against upon arriving in 1906, Kuniyoshi persevered to become a popular teacher at the Art Students League in New York. His success as a painter in the 1930’s encouraged his thinking that he had become an American, a belief that was shattered with Japan’s attack on Pearl Harbor in 1941. Kuniyoshi worked tirelessly for the American war effort, designing posters and writing two speeches that were broadcast over the radio to Japan in 1942. Unfortunately, after the conflict ended a decade long Cold War continued the discrimination against him and prohibited his gaining citizenship. 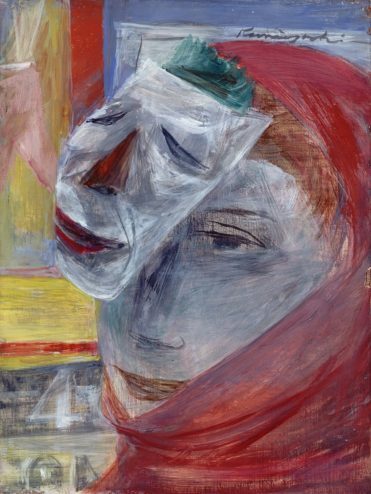 This, coupled with the rising popularity of Abstract Expressionism, heightened his frustration about his circumstances. He adapted to the changing aesthetics by significantly brightening his palette and including surrealistic elements referring to his Asian background. Ironically, by the time the government passed laws enabling Asian naturalization, Kuniyoshi had contracted stomach cancer and died before his application was approved. Paintings, drawings, and prints from lenders including the Museum of Modern Art, the Whitney Museum of American Art, the Wadsworth Athenaeum Museum of Art, and the Herbert F. Johnson Museum at Cornell University, alongside works from the permanent art collection, develop an engrossing visual narrative explaining the life and work of this unique artist. Thursday, September 6, 5:00 – 7:00 p.m.
Join the SUArt Galleries to celebrate the opening of the newly installed exhibition Forbidden Fruit: Yasuo Kuniyoshi’s America, on view in the galleries August 16 through November 18, 2018. Wednesday, September 12, 12:15 p.m.
Join David Prince, associate director and curator of collections, for a tour of Forbidden Fruit and look at artwork in the exhibition, as well as learn the importance of the work to our collection at the SUArt Galleries. All events are free and open to the public. Please visit suart.syr.edu for more information on parking and directions to the galleries.